Dusit Thani Maldives – Located in Mudhdoo Island in Baa Atoll, a UNESCO world biosphere reserve, Dusit Thani is a Luxury Resort offering a stunning clear house reef and azure lagoons. One can experience authentic Thai hospitality with unmatched beauty of Maldives at Dust Thani. With only a 35 minutes picturesque seaplane transfer from male international airport and 10 minutes speedboat from the Dharavandhoo Domestic Airport in Baa Atoll, one can reach this serene island encircled by chalky white sandy beaches. 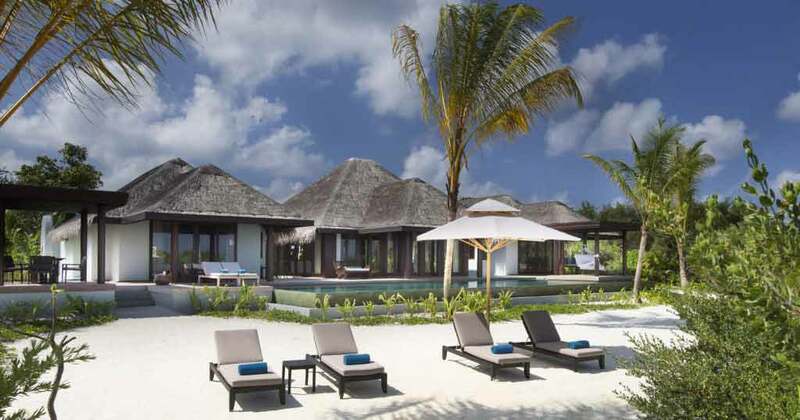 This luxury island offers a host of facilities and activities to indulge oneself in. 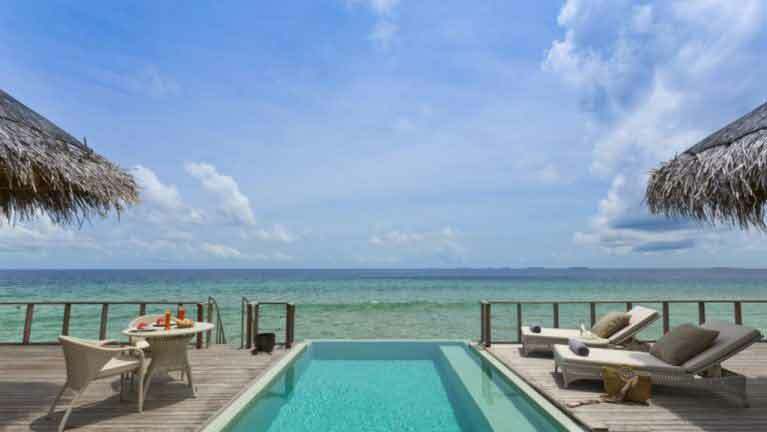 One can dive and snorkel and experience the marine life and watch house reefs passing by, swim in the infinity pools, pamper oneself with spa treatment Devarana spa, dine at one of the finest restaurants the Resort has to offer and retreat back and relax in the comfort of villas. This resort is a perfect place to relax and enjoy the serenity around for families and couples. Extra bed – one (1) extra bed is free of charge on for children under 12 years old sharing the same room with parent(s). Meals – meals for children under 12 years of age is free of charge. Seaplane is available during daylight only (6 Am to 4:30 Pm). Located in northwest side of the island, Devarana Spa is an exclusive Maldivian thatched roof villa offering an array of massages and treatments. Calm and peaceful , Devarana spa offers 6 deluxe treatment areas designed according to the taste of the guests. The spa also offers sauna, swimming, manicure and pedicure. Applicable for bookings confirmed minimum 60 Days prior to arrival date. Surrounded by lush green foliage and endless white beaches, beach villa is a perfect beach side hideaway. 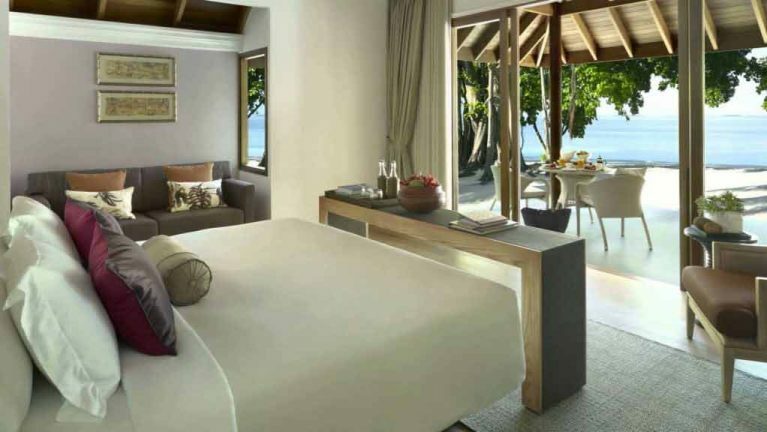 Enjoy the comforts of the king size bed, and wake up to view of the sun rising from the deep blue ocean. Bask in the sun and enjoy the endless ocean from your private terrace well-furnished for lounging. The villa also features an outside patio leading directly to the ocean where one can relax and dine. Beach villa with pool is an ultimate beach side getaway set across lush vegetation, and endless white beaches. This villa is inspired by Thai interiors, and offers an enliven living space. 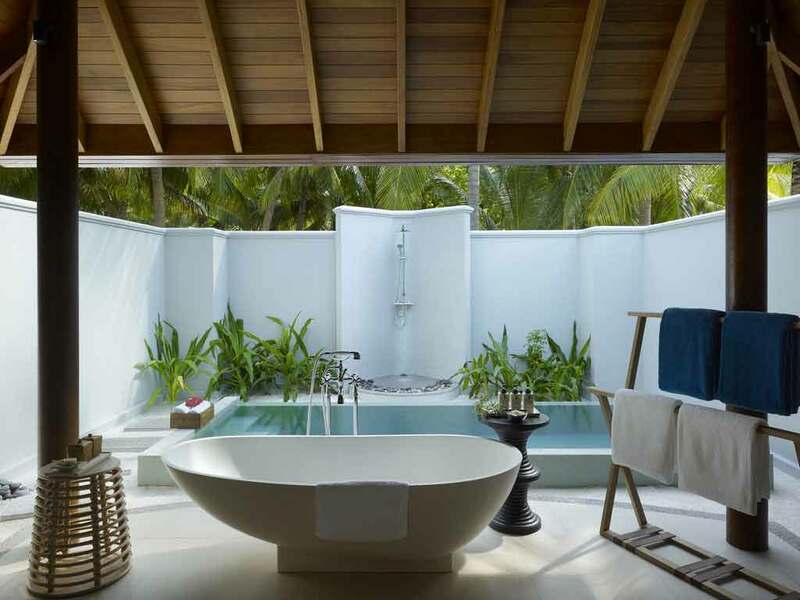 With a private plunge pool, open air garden bathroom with rain shower and bathtub, private terrace for lounging and relaxing, beach villa with pool is an ultimate choice for guest who want a natural haven. 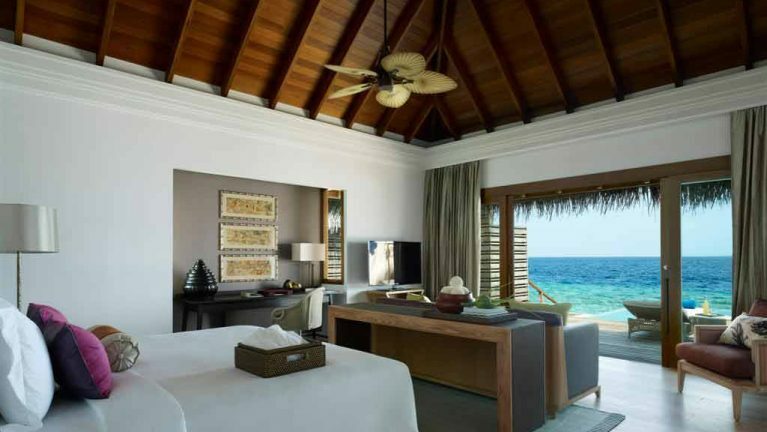 Perched above the ocean, enjoy the unmatched beauty of ever changing turquoise hues of the lagoon, shimmering ocean from the comforts of your villa. Dive or swim in the ocean from your private deck or enjoy the invigorating view of the ocean from your private infinity pool. 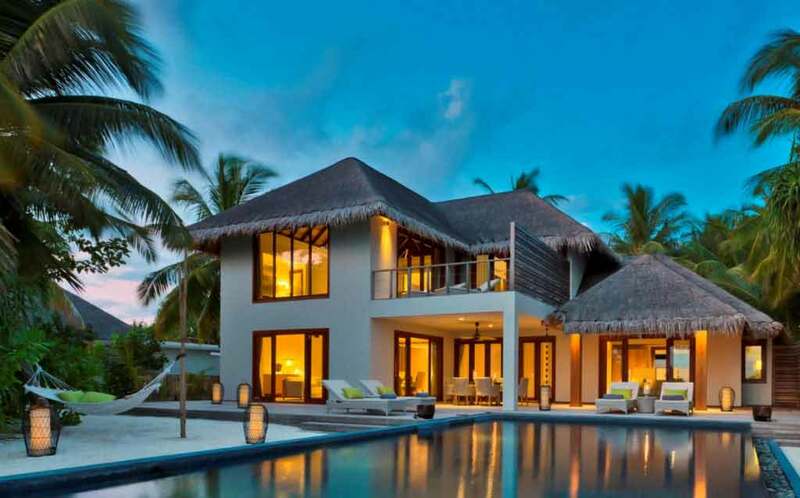 Enjoy this spacious villa with natural light setting, with Thai interiors and thatched roof to provide the Maldivian touch, well designed and well furnished. 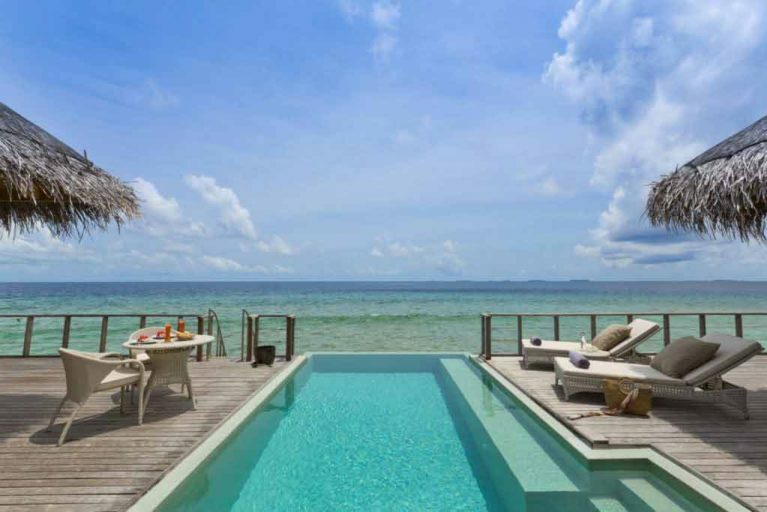 Stilled above the ocean, ocean villas offers an unparalleled view of deep blue Indian Ocean one can enjoy from the comforts of the villa. With direct access to the ocean, one can dive or swim from their villa in the ocean and explore the marine life and meet with colorful house reefs. With spacious living area, with Thai interiors the villa is well appointed and well-furnished to provide guests all the comforts they need. The villa features glorious bedroom with king size bed, oversized bathroom with bathtub, indoor and outdoor lounging area, private pool. This 2 storey residence is the ultimate luxurious accommodation the villa has in offer. This spacious residence set across the white sandy beaches, is a blend of style, comfort and privacy. The spacious master bed on the first floor with king size bed, en-suite bathroom, and a balcony from where one can enjoy the majestic view of the island. The 2 bedroom is airy with twin beds and en-suite bathroom with bathroom amenities. The villa features elegant outdoor patio, wine cellar and kitchenette with complimentary non-alcoholic beverages and beer from the mini bar. This villa is perfect choice for families and group of friends who wish for tranquil peaceful holiday. 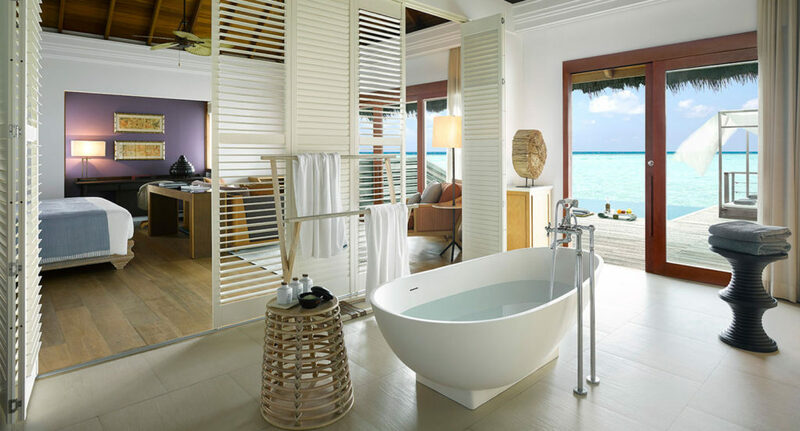 Stilled over the sparkling blue ocean, live your tropical dream in this private floating paradise. Offering 2 bedroom with a perfect backdrop of the ocean, one can enjoy the romantic sunset from the bedroom as it dips down the horizon. The villa features indoor and outdoor dining area, airy living room, open air bathroom with open shower and bathtub, wine cellar, private pool, and private deck for lounging. 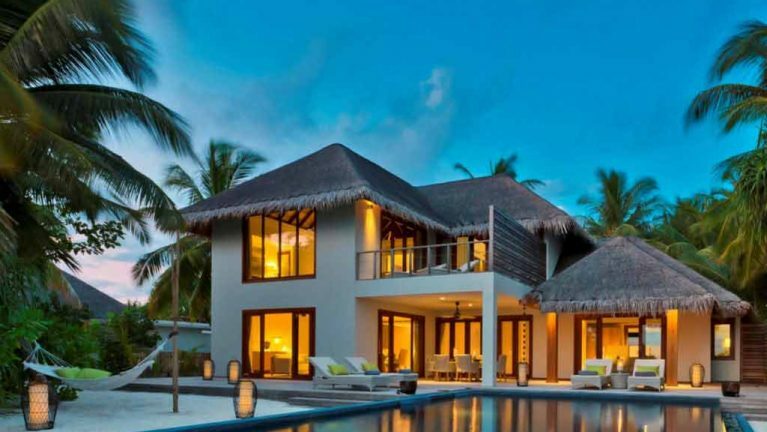 This villa is designed for families on their tropical vacation who want complete privacy and seclusion in the natural beauty of swinging palm trees and lush vegetation. With 1625 sq.m this villa is spacious offering 2 bedroom with one master bedroom with parents and another for kids with twin beds. The villa offers open air bathroom with open shower and bathroom, living room, wine cellar and a kitchenette with complimentary non-alcoholic beverages and beer from the mini bar, spacious outdoor patio. With direct access to the beach and ocean, one can always walk in the sandy beaches or swim in the deep blue ocean. The master king bedroom on first level opens on to a private patio, with sun loungers from which to enjoy untainted ocean views. A second twin bedroom is secretly concealed on the ground floor, adjoining a large living area. With comfortable furniture, a LED TV and a BOSE Sound System, the living area opens on to a verandah by the pool with a dining area for 6 guests. A tropical patio associates the villa to a neighboring detached villa which includes its own plunge pool, beach pavilion, semi open bathroom with rain shower and master bedroom. At Dusit Thani Maldives, the natural beauty of Maldives meets with succulent cuisines creating a unique dining experiences. Dust Thani offers 6 restaurants serving local authentic cuisines and international cuisines, taking guest in a gastronomical journey. Enjoy the signature dishes, that will delight your senses. Border-less Dining: Romantic couples and honeymooners who want a private getaway to savor the sumptuous cuisines, border less dining is for you. 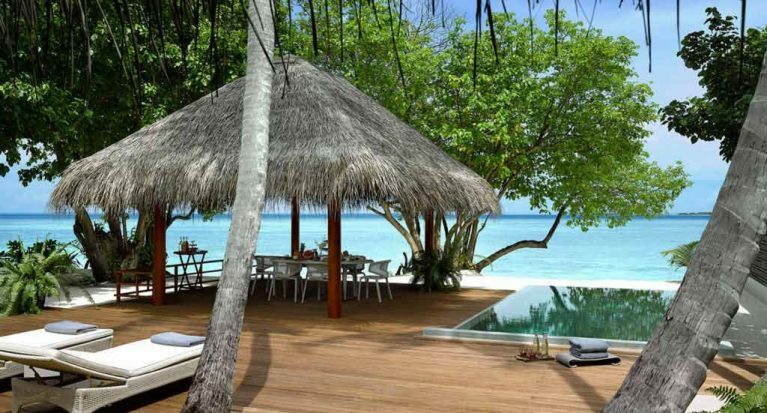 White sandy beaches, Azure Ocean, candle-lit and just you two, a perfect place to dine. The Market: The self-serving restaurant with a la carte menu, offers full breakfast buffet, palate pleasing dinners with sweet, colorful pastries with a backdrop of unmatched Maldivian beauty. Sea Grill: Gaze into the stars as you savor the finest cuisines from across the world at Sea grill. Enjoy fresh sea food, steak, accompanied by a wine cellar offering the finest selection from vineyards around the world. Enjoy the signature dishes sea grill as to offer such as Pan Seared Local Reef Fish, Sous Vide Salmon or from the Butchers’ Block indulge in Assiette of corn-fed Chicken and Sirloin Steak. Benjarong: Benjarong is an authentic Thai restaurant ,serving thai signature dishes including Phla gung tom yum poe taek, crepe peuk. Tantalize your taste buds with Thai style lobster, crispy reef fish, roasted duck. Sala Bar: Enjoy the coolest breeze whilst sipping tropical cocktails, Thai cocktails. Enjoy the panoramic view of the mesmerizing beauty around in this open air bar. This is perfect for couples who want to stargaze while enjoying romantic drinks. Sand Bar: Located near the infinity swimming pool, this place is perfect to hang out with friends and family for per-dinner. Savor the light snacks and tropical cocktails whilst enjoying the changing skylines and sunsets. Island with beautiful house reef. 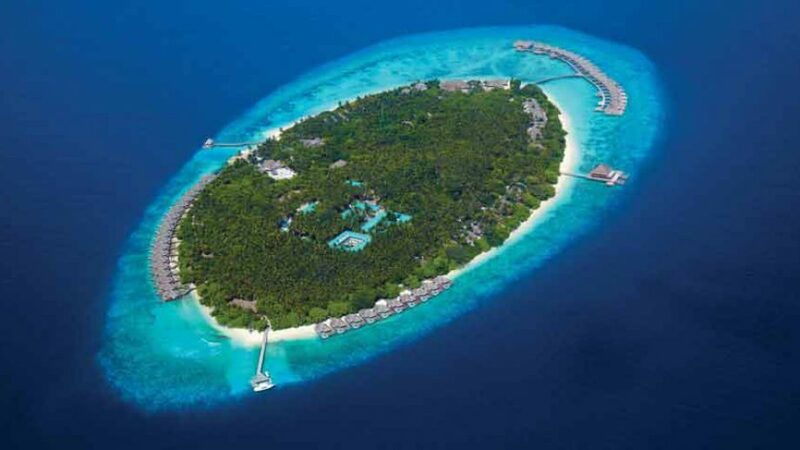 Only Atoll of Maldives reserved by UNESCO World Biosphere.